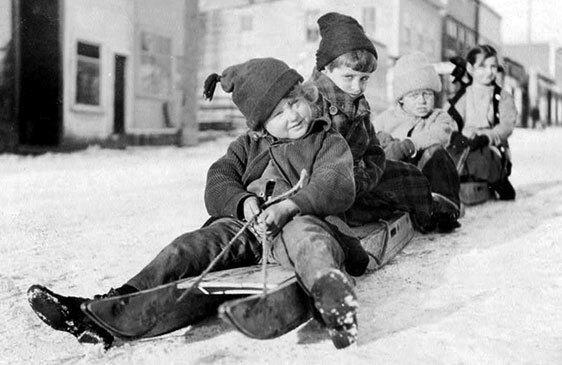 At the turn-of-the-century, when deep snow covered the ground and was so crusted with ice that it could not easily be broken through, sledding or coasting (the 19th century term) was a popular sport for both boys and girls. There were sleds of many shapes, sizes, names, and colors. There were some thick, heavy plank sleds and lighter board sleds; but the prettiest of all were the light but strong frame sleds. Among these were the “Arrow,” the “Rover,” the “Racer,” the “Swallow,” the “Eagle,” and many others. 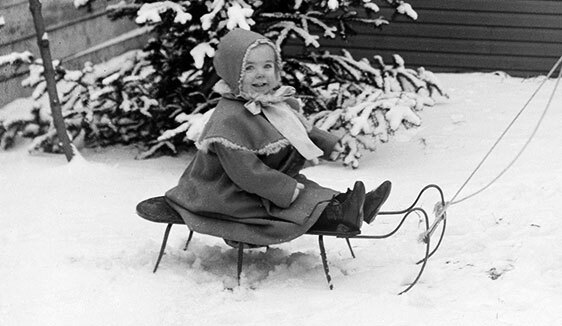 Children enjoyed brightly painted hardwood sleds that featured beautifully colored top designs and some had goose or swan neck ornaments. There were red sleds, yellow sleds, green sleds, and blue sleds. In 1897, the Eclipse Coasting Sled Mfg. 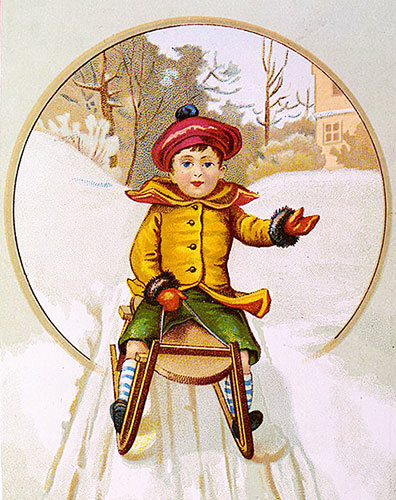 Company from Connecticut advertised two sleds for children. Above right is the “Daisy Coasting Sled”, made in two sizes especially for girls. On the left is the “Eclipse Coaster” designed for boys or larger people. This sled featured two steering guides, which were used for either breaks or as a steering guide. Both sleds were made of ash and varnished. Early 1900s sled is finished on natural wood with the top painted in different colors. Length 31 inches; width 10 inches. Wood varnished sled with the tops nicely ornamented in assorted designs. Length 34 inches; width 13 inches. This early 1900s vintage sled is finished on natural wood with the top decorated in assorted designs and fancy goose necks. Length 35 inches; width 12 inches. This vintage sled has wide raves with the knees bent in half circles and set at an angle. The frame is varnished on natural wood and it has nicely tinned Swan necks and oval shoes. Vintage sled made of oak with a beautifully decorated top. It is shod with half oval shoes extending over the noses. The knees are braced to the runners and all the side braces are riveted through both knees and runners. Length 34 inches; width 11 inches. Early 1900s sled made of hardwood and painted in bright colors. It has large Swan necks, half oval shoes, and is brightly trimmed. Length 38 inches; width 15 inches. What great fun to have one of these elaborate outdoor playhouses.